Journal of Bacteriology and Infectious Diseases is an open access, peer reviewed, scholarly journal that aims to publish original research studies that may help in understanding the pathological and clinical aspects of disease causing microbes apart from focusing on the prevention, therapy, disease management and cure. 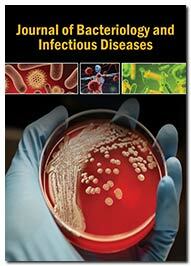 Journal of Bacteriology and Infectious Diseases incorporates articles from all aspect of understanding related to Bacterial Ecology, Bacterial Infection, Pathogenic Bacteria, Bacterial toxins, Bacterial genomics, Bacteraemia, Salmonella, Bacterial Diseases, immunology, bacteriology, mycology, virology, parasitology, Parasitic Worms, Anthrax, Biological weapons, Clostridial infections, Leprosy, Listeriosis, etiology, pathology, and pathophysiology of the causative agents of infectious diseases. The journal prioritizes the publication of scientific manuscripts that serve to provide insights into hitherto unexplored realms of clinical microbiology and infectious diseases such as, development of multi-drug-resistance (MDR), development of novel vaccines and antibiotics to counter-act the effects of MDR, multiplicity of infection and disease diffusion mapping. The journal also publishes manuscripts that contain novel discoveries on the ecology, biochemistry and genetics of pathogenic bacteria, viruses, fungus and other infectious parasites. Contemporary findings pertaining to the development of highly advanced diagnostic and therapeutic methods against infectious diseases viz. malaria, influenza, tuberculosis, leprosy, whooping cough, polio, Hepatitis-A, HIV/AIDS, etc. are solicited. The journal strictly adheres to a single blind peer-review to maintain the quality and originality of the published articles. Submissions can be made through an email attachement. Deusilene S. Vieira, Suyane da C. Oliveira, Alcione de O. Santos, Lucas S. Oliveira, Debora da S. Lopes, Luan Felipo Botelho-Souza, Juan M. V. Salcedo, Lourdes M. Borzacov, Natanael da C. Arruda. Abbas Abel Anzaku*, Abel Gladys Angbalaga, Ale Cecilia Achetu, Akharenegbe Pedro, Oche Daniel Idibiah, Okezue Chukwuemeka James.